Krissys Creations: Tanyas card sketch! 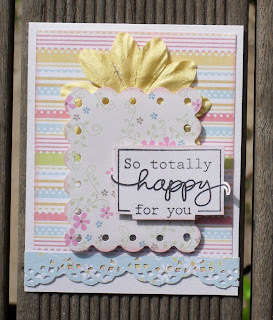 This is my card created using a sketch by the fabulous Princess Tanya! !Loved this sketch :D it was the perfect excuse to make a card for some friends who have found out they are expecting their second child :) Head on over to wicked princesses to have a go at the sketch!! Do you like blind scrapping?? Would you like to do a blind scrap with me?? I'll be back tomorrow for sketch day lovelies! P.S. Lovely card, by the way!!! Just dropped in to share the love :) Thanks for following my blog - I hope to have it looking as beautiful and fabby as yours soon! Awww thanks Moi and Ali!